The La Vista Police Department has partnered with the Nebraska Humane Society to give adoptable dogs a better chance at finding their forever home! On a regular basis, La Vista officers will take NHS dogs out on patrol. This will help the dogs become more social and will help the community know about the animals available for adoption through the humane society. Tomorrow is K9 for a Day! 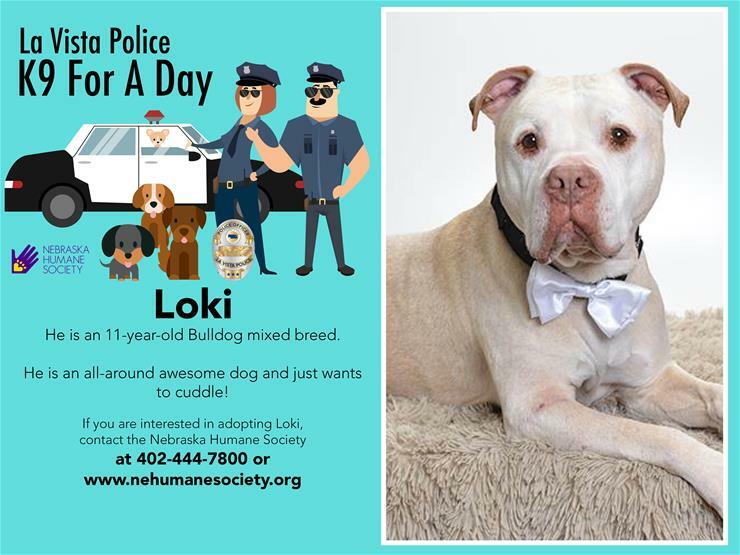 Meet Loki, an 11-year-old Bulldog mixed breed, who will be partnering up with La Vista Police Department Officer Dana Miller on Friday, March 15. We'll be visiting some local businesses between 10 a.m. and noon! Follow along on our Twitter account and at the end of the day we'll post photos here of our adventures!